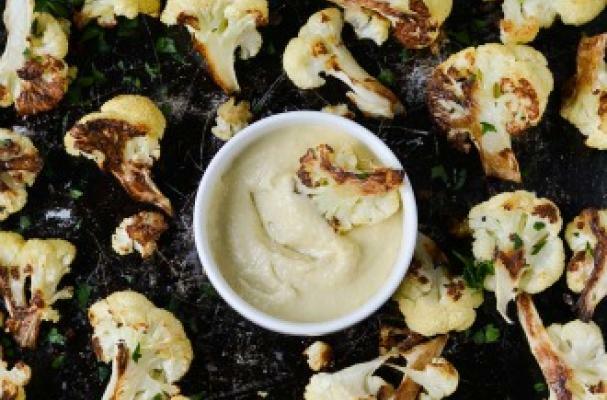 Roasted cauliflower with tahini sauce from Apples and Sparkle is an incredibly delicious vegetable dish. Cauliflower florets are doused in olive oil and sprinkled with salt and pepper before being roasted in the oven. As they bake, their natural sugars caramelize and create a golden brown crust. Tahini is a sesame seed paste that is used extensively in Middle Eastern cooking. It can be found in your local grocery store, Middle Eastern market or gourmet foods store. This flavorful sauce, similar to hummus, is made in a food processor with a combination of lemon juice and garlic. Roasted cauliflower is a simple recipe that everyone will love. Click here for full recipe instructions!